Set up a pre-trained ResNet-34 with average-pooling and fully connected layers removed. Start with an image of a certain size with random pixel values. Make it a PyTorch variable with requires_grad set to True, so as to update it's values during backprop. Let's call this variable $G$. Set a hook on a specific layer in the network so as to get intermediate activations. Put the model in evaluation mode so that it's parameters won't get updated during backprop. For a number of iterations, pass $G$ through the network. Set the loss to be equal to the negative of the mean of the activations captured by the specific feature map, and backpropagate. Upscale the resultant input image by upscaling_factor, and smooth it by using a blurring filter. Perform the last two steps for upscaling_steps number of times, so as to get a reasonably sized resultant input image. Later on, I'll be calculating mean activations per feature map for a specific input image. This can be achieved by simply putting a hook on the specific layer, and then calculating mean activations for all feature maps output from that layer. Putting all of this in classes. Let's check out the model. It's ResNet-34 architecture with the average-pooling and fully connected layers removed. 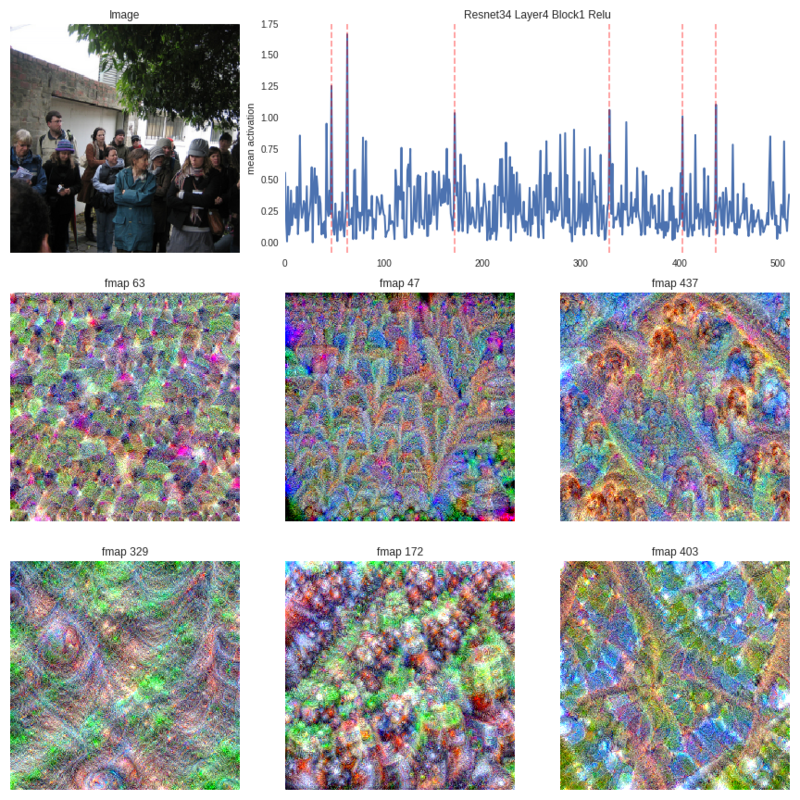 This is done so as to work with images that result in feature maps with size less than (7,7) after the convolutional layers. 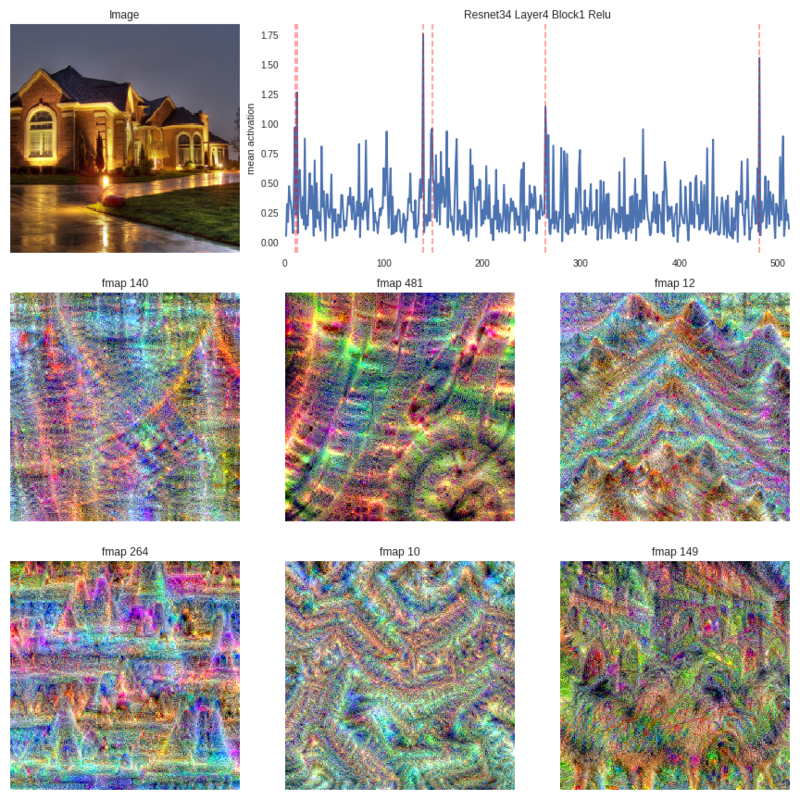 Anyways, we're only concerned with the convolutional layers for this exercise. 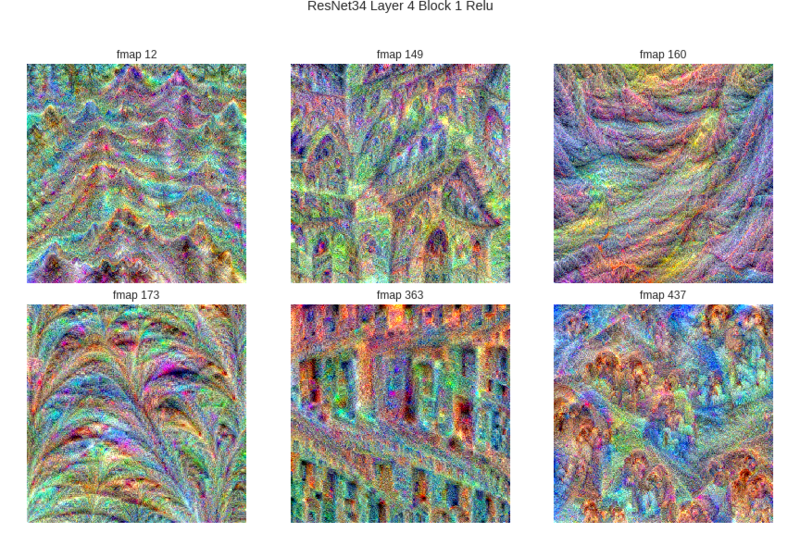 I'll be using PyTorch's convention of blocks and layers. So in this case, the model is made up of 8 components, the 5th, 6th, 7th, and 8th components being layers with 3, 4, 6, and 3 blocks respectively. Let's start with visualizing inputs that maximise the activations of the first conv2d layer. Let's run the same for Conv2d layers further down the network. 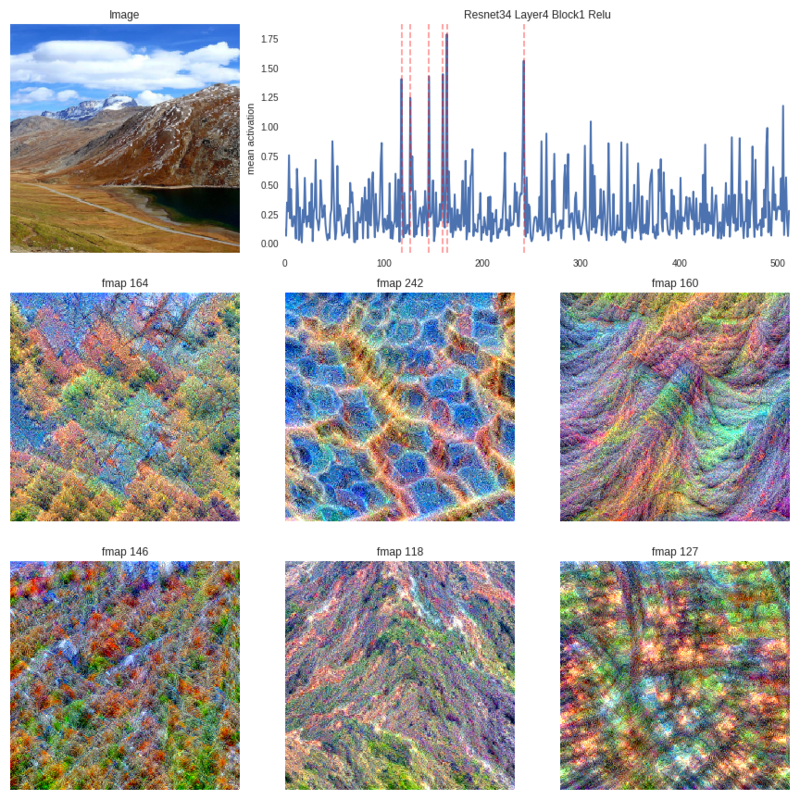 As seen from the above images, the input structures that excite specific feature maps get progressively complex as we move deeper into the network. All these images are hosted on Imgur here. I also ran the whole thing for all feature maps of conv1 and relu of Layer-4-Block-1 and the results can be seen here and here. A lot of these results don't make it immediately obvious as to what object the feature map is detecting, but I'll plot a few interesting ones that do. As seen in the image above, feature map 12 of the activations from Layer 4 Block 1 ReLU seems to identify triangular structures. Feature maps 149, 160, 173, 363, 437 seems to be detecting the presence of arched windows, hilly terrain, archways, windows, and people respectively. Let's put this to test. 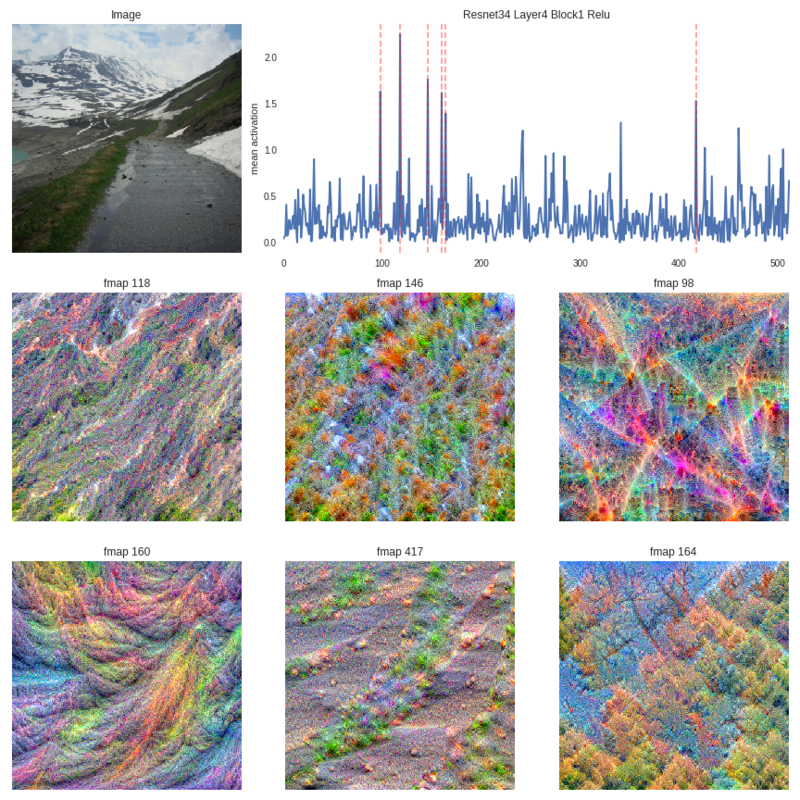 We can pass a test image through this network and retrieve the activations from a certain layer. We can then figure out which feature maps are activated the most by calculating the mean of activations per feature map. Then we'll plot inputs for the top n most activated feature maps. Feature maps 12, 140 and 264 seem to be detecting triangular structures like the house's roof. Feature map 149 seems to be detecting arched windows. This is pretty cool! Let's run this for more images. Feature maps 173and 149 seem to be detecting arched structures, which are present in the image. Can't comprehend what the others are being activated by. It seems to me that all of these feature maps are detecting the presence of mountainous terrain. Same goes for the next image. I've run this for a lot more images and for different layers of the network, but I can only put up so many on the blog. The rest can be found here and here. 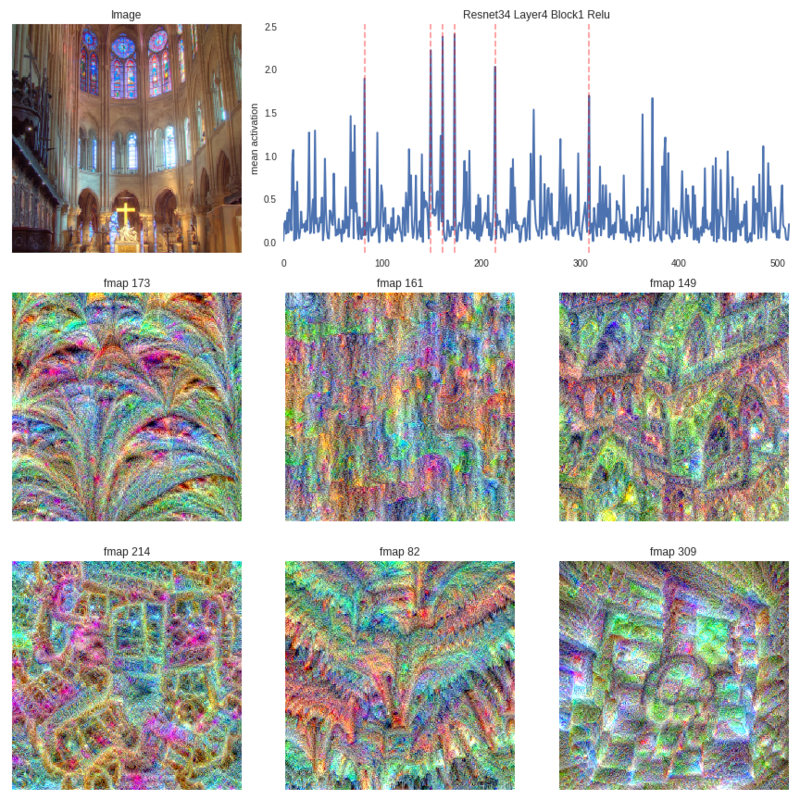 Visualizing inputs that maximally activate feature maps has greatly demystified the workings of convnets for me. Zeiler and Fergus present the evolution of the feature maps pretty well in their paper, but exploring it on your own is definitely worth it. I've also run the same experiments on VGG16 architecture and the results can be found here and here.